Our unique Sinclair Lite saddle design combines the best features of English, Western and Plantation saddles. The Sinclair Lite offers exceptional value for riders looking for the comfort and style offered by a Plantation saddle. This saddle offer the seat comfort and security found in Western endurance saddles along with the leg comfort of English style stirrup leathers. 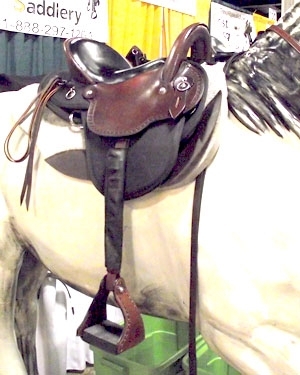 The Sinclair Lite saddle come with endurance stirrups standard. The Sinclair Lite can be set up for English or western rigging, along with many other saddle options. It is the lightest saddle we produce. As with all of our saddles, the Sinclair is built to order based on your measurements. IT IS BEST TO CALL US WHEN YOU ARE READY TO ORDER! We have a lot of options available for this saddle. 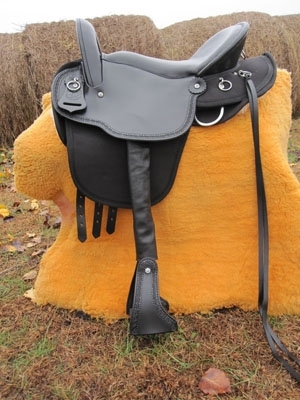 Our Sinclair Lite saddle design was inspired by plantation saddles from the South which we modified to take advantage of modern technology and our years of experience in leading organized trail rides. In our flare trees, the gaited horse’s shoulder is free to move and the rider is placed in the center balanced position that has been proven superior over centuries of riding. The Sinclair Lite offers a variety of rigging options to prevent galling and promote saddle stability. Crest Ridge Saddlery places a premium on rider comfort too. Our saddles have Supra-Cor padded gel-like seats covered with glove leather standard. We use only Wicket and Craig #1 leather, except for billets. For enhanced durability we use only stainless steel hardware and real Blevin's buckles. Before ordering this saddle, please follow the instructions on our "How to Measure" page in our Knowledge Base or at www.crestridgesaddlery.com/howtomeasure.html. The measurements and photographs are absolutely essential for us to be able to produce a saddle that we can guarantee fits your horse. When ready to order, it is best to place a phone order so we can go over everything with you in detail. The tree is solid pine wrapped in fiberglass. Seat is covered in glove leather and padded with SupraCor.